Tiling Tips: What's Wrong With This Picture? If you're looking for fast tiling tips, this is the right place. That's because the tiling tips here—bathroom and kitchen, mainly​—are meant to be quickies that you can absorb in an instant. Some are intuitive; others not so intuitive (and one is an outright rant). In the ledge shown in this image, the tiler committed one major boo-boo. Instead of extending the horizontal window ledge tile all the way and having it cover up the edge of the vertical wall tile, the tiler has done the exact opposite. Making the edge of a tile more obvious. Subjecting the tilework to more wear and tear. It just looks really bad. What's the right way to tile a ledge? In this example, the tiler has tucked the edge of the wall tile under the ledge tile. See? Much cleaner. And it protects the tilework better. This tiling tip shows you why tilers like to think "center outward." Starting the tilework at one end and working in the other direction nearly always guarantees a weirdly sized tile at the far end that stands out like a sore thumb. By thinking "center outward," you may still end up with small tiles at the extreme ends—but at least they are symmetrical. This tiler chose to leave exposed tile edges. There are a number of ways to deal with tile edges, and this is one way that works well. If you want to do this, use Durock tile backer board for a cleaner edge. Then paint the tile edge the same color as the wall. Tiling Tips: Backsplash and Cabinet. Mind the Gap! It's always hard to gauge how close your tile backsplash will come up to the bottom edge of the cabinet. One way to handle this is to install the cabinets afterward and make sure that they exactly fit the top edge of the tile. But this is a lot of work, and cabinet positioning can afford only so much leeway. Or you can cut slim pieces of tile to fill in the gap. This is the most professional solution. Or you can do what some DIY tilers do: ignore the gap altogether. Functionally, it does not matter if there is a gap. And it's an area that rarely gets any scrutiny. Instead of caulking the joint between tile and laminate countertop, this DIY tiler has used grout. Cracking and general ugliness have resulted. Use the appropriate caulk between the tile and any non-tile material. When tiling bathtubs, backsplashes, and other areas that use limited quantities of tile, buy the best quality tile you can afford. Consider the facts. In a bathtub area, the cost difference between using this cheap, bland $0.69 tile and a better-quality $4.75 tile is negligible. 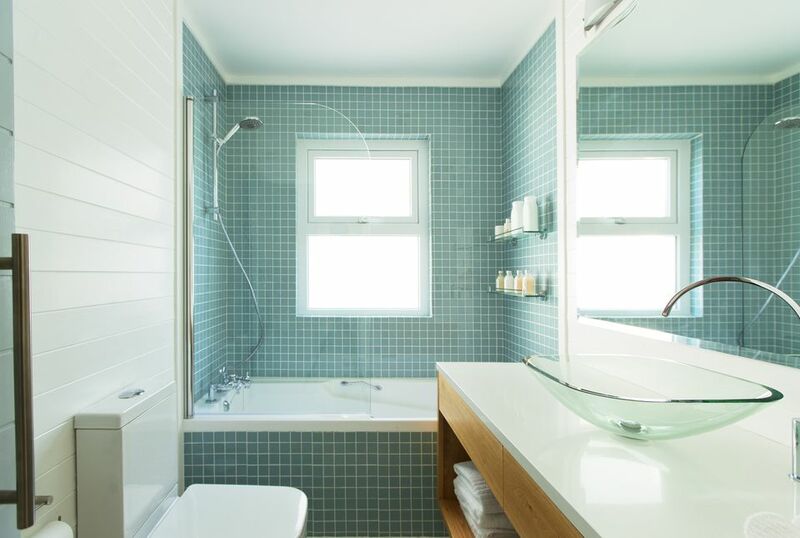 Let's estimate purchasing 40 full-sized, 12" x 12" ceramic tiles for a standard bathtub area. Buying the better quality tiles means paying an entire $162.40. It simply is not worth saving the $162.40 in the context of a tile installation that will be a daily sight for decades to come. Unless buying massive quantities of tile, where price will be a factor, do yourself a favor and buy the tile you want. If you like the $0.69 "landlord's special," then have at it. Otherwise, buy upward.